Before explaining how ecstasy works, it may be helpful to point out the areas of the brain that are sensitive to the effects of ecstasy. ecstasy affects cognition (thinking), mood, and memory. It also can cause anxiety and altered perceptions (similar to but not quite the same as hallucinations). The most desirable effect of ecstasy is its ability to provide feelings of warmth and empathy. 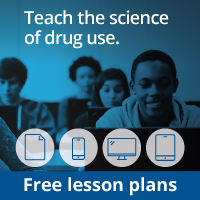 Tell students that you will talk about the effects of ecstasy in more detail in a few minutes. There are several parts of the brain that are important in these actions of ecstasy. Point to the neocortex (in yellow), which is important in cognition, memory, and altered perceptions. Point to the several structures deep in the brain that make up the limbic system (e.g., the amygdala (red), hippocampus (blue), basal ganglia (purple), and hypothalamus (green), which is involved in changes in mood, emotions, and the production of anxiety (the hippocampus is also involved in memory). Scientists do not know yet which area of the brain is involved in the ability of ecstasy to generate feelings of empathy (you could ask students to suggest where they think ecstasy might do this - limbic areas are a good guess).